At almost 20 weeks pregnant, I find myself comparing the pain of anything that happens to me to labour. For example, I stubbed my toe against our bedpost the other day while picking up laundry. It hurt like hell but all I could think about was ‘I wonder how this pain compares to labour?’ Which makes about as much sense as comparing Amy Winehouse and Anne Hathaway on a style scale. But pregnant Ezmy doesn’t shy away from the nonsense thoughts, as we well know. Second, and in some ways far worse, is the Beautiful Experience type of answer. Which, unsurprisingly, often comes from those same women who insist that pregnancy is a beautiful journey (interesting, yes. But beautiful? No.). You know the ones – ‘Oh I was so caught up in the magic of the moment, I barely felt the pain’, or ‘Well, my labour lasted about 45 minutes…I guess it was painful’, and my personal favourite, ‘I don’t know what these other women are complaining about – I don’t remember labour being that bad.’ Really? Really? You pushed out an 8lb watermelon and you don’t remember it being that bad? All I can say is pfft. What the variety of answers means of course is that no one’s experience will help me. 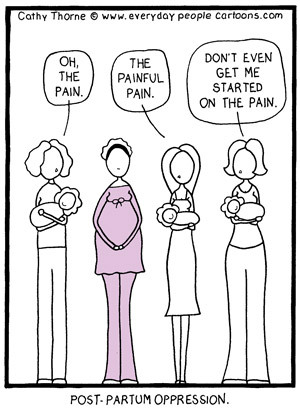 Neither will comparing the pain of stubbed toes, paper cuts, and foot cramps to the pain of labour on some irrelevant pain scale. There is nothing I can do to prepare myself for this, just like there is nothing I can do to prepare myself for my life post-pregnancy. >I love Ina May Gaskin but I won't lie, it's hard work.Hey, you get a baby in the end.